Processing of Auditory information is a difficulty that affects so many aspects of language development and the ability to address this difficulty in an authentic learning environment is an ongoing challenge for therapists working with these children. All too often, the child performs well within the therapy context, but is unable to transfer these skills to the classroom setting. Auditory Workout is an App that addresses this need. Auditory Workout app includes hundreds of audio instructions and a BACKGROUND NOISE Feature that allows users to set background noise (classroom noise), so that learning is authentic. Basic Directions: 15 levels within this category ranging from “one-step directions with object” to “one-step directions with size, color, object, action, preposition, and object. 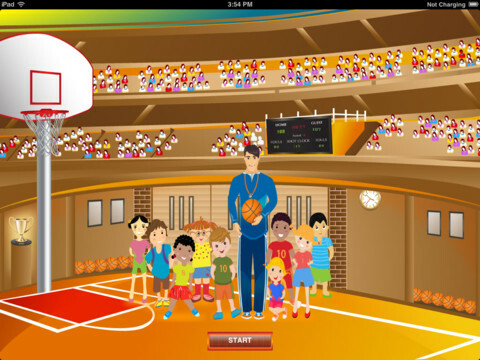 Children accumulate basketballs as a reward for each correct response and are rewarded with a game when they accumulate enough balls. Instructions can be repeated as many times as necessary and if a child fails on a task then the item can be re-done. You must turn the Automatic Paging Feature to OFF in the settings menu in order to do this. The app is easy to navigate and can be used by parents with their children for extra practice. The Background Noise Level can be turned off or on and adjusted with differing intensity levels. The App is very detailed and is well graded so that the child can progress through increasing levels of complexity. Reports are specific and you can select a report based on the activity that the child completed or by the time/date that each task was done. Although the incorrect answers are displayed (if this setting is selected), it would be nice if the response to errors was more specific. For example, when targeting the concept “BEFORE”, (Show me the candle before you show me the phone), and the child taps the phone first, both items are shown simultaneously and the concept of BEFORE is not highlighted. A record feature would add an additional Expressive Language Dimension to this App. It is quite expensive but I cannot find a comparable App and so at this stage it is good value for money. Thank you to Virtual Speech Center for providing me with this App.